Two-phase orthodontic treatment is a very specialized, proactive process that encompasses jaw changes, facial changes, and tooth straightening. The major advantage of two-phase treatment is to maximize the opportunity to accomplish the ideal healthy, functional, aesthetic, and comfortable result that will remain stable. In some cases, completing orthodontic treatment in two phases avoids adult tooth extractions or major jaw surgery. 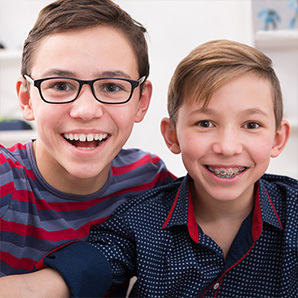 When undergoing two phases of orthodontic treatment, the first phase mainly addresses the jaws with self-activating expanders, while the second phase straightens the teeth and corrects the bite using the Physiodynamic® System or Invisalign®. The first phase is a critical set-up for the second. The first phase of orthodontic treatment is one of the most rewarding treatment options Dr. Held offers to our patients, since it is proactive. The idea of the first phase is to guide growth positively, create space for un-erupted teeth, break habits, and prevent trauma before it is too late. Using children’s growth potential in a positive way while they are still very young is key. The first phase is completed on children between the ages of seven to ten. Young children are flexible and compliant, and their growth potential is still at a maximum. Treatment usually lasts six to 12 months, after which retainers are placed to hold the new position for ten months. Once the jaws have settled in their new positions, the retainers are removed, and patients are regularly monitored until they are ready to move into the second phase. Most children will require a second, more comprehensive phase of treatment in order to create a superbly fantastic smile with a stable, healthy bite. The second phase of treatment begins when most of the adult teeth have erupted (i.e., grown in). This second phase is typically much simpler and shorter than a full case on a patient who has not gone through the first phase, and the results of Two-Phase Treatment are significantly better than on patients who needed a first phase, but waited for all of the adult teeth to come in instead: Too much time and growth potential have been lost by then. Patients who need and undergo both phases enjoy outstanding results! After the second phase of treatment, retainers will be worn ten to 12 hours daily in order to hold the teeth in their correct position.